Definition at line 37 of file CCompartment.h. Definition at line 36 of file CCompartment.cpp. References CKeyFactory::add(), CONSTRUCTOR_TRACE, CModelEntity::FIXED, CCopasiRootContainer::getKeyFactory(), initObjects(), CAnnotation::mKey, CModelEntity::mpIValue, and CModelEntity::setStatus(). Definition at line 53 of file CCompartment.cpp. References CKeyFactory::add(), CONSTRUCTOR_TRACE, CCopasiRootContainer::getKeyFactory(), initObjects(), and CAnnotation::mKey. Destructor. The destructor does nothing. Definition at line 64 of file CCompartment.cpp. Definition at line 175 of file CCompartment.cpp. References CCopasiVectorN< CType >::add(), CCopasiObject::getCN(), CCopasiObject::getObjectParent(), CRenameHandler::handle(), mMetabolites, and CCopasiObject::smpRenameHandler. Referenced by createMetabolite(), CModelExpansion::replaceInMetab(), and CCopasiXMLParser::MetaboliteElement::start(). Definition at line 123 of file CCompartment.cpp. References CCopasiVector< T >::cleanup(), and mMetabolites. Definition at line 165 of file CCompartment.cpp. Definition at line 71 of file CCompartment.cpp. 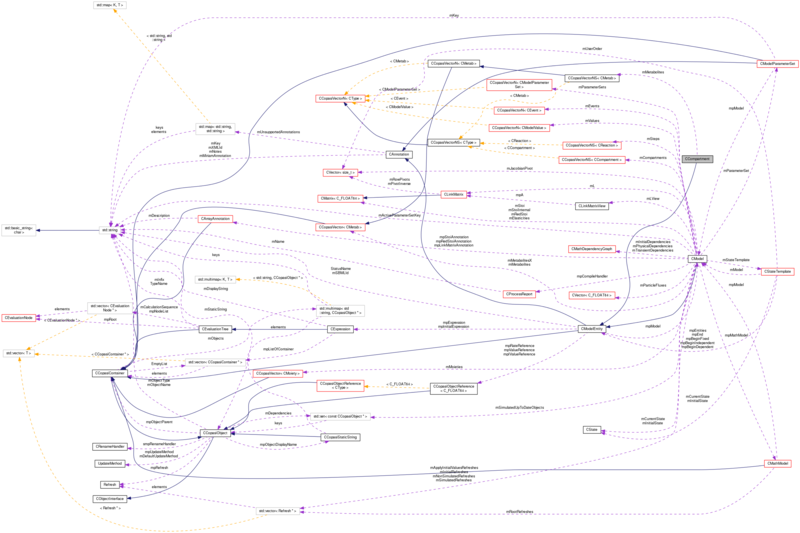 References CModel::getAreaUnitsDisplayString(), CModel::getLengthUnitsDisplayString(), CModel::getTimeUnitsDisplayString(), CModel::getVolumeUnitsDisplayString(), mDimensionality, CModelEntity::mpIValueReference, CModelEntity::mpModel, CModelEntity::mpRateReference, and CModelEntity::mpValueReference. Referenced by CMetab::getChildObjectUnits(), and CModelParameter::getUnit(). Definition at line 125 of file CCompartment.cpp. Referenced by CModel::appendDependentModelObjects(), CModel::removeCompartment(), CQCompartmentDM::removeRows(), and CQCompartment::slotBtnDelete(). Definition at line 204 of file CCompartment.cpp. Referenced by CModelAdd::addCompartments(), CSBMLExporter::createCompartment(), SBMLImporter::createCReactionFromReaction(), CSBMLExporter::createInitialAssignment(), CSBMLExporter::createKineticLaw(), CSBMLExporter::createRule(), CModelExpansion::duplicateCompartment(), CSBMLExporter::exportEventAssignments(), SBMLImporter::importEvent(), SBMLImporter::importInitialAssignments(), SBMLImporter::importRuleForModelEntity(), CQCompartment::load(), CSBMLExporter::replaceSpeciesReferences(), CQCompartment::save(), and CCopasiXML::saveModel(). Definition at line 157 of file CCompartment.cpp. Referenced by CQCompartment::copy(), SBMLImporter::createCMetabFromSpecies(), CQSelectionWizardPage::fillTree(), CMetabNameInterface::getMetabolite(), CQCompartment::loadMetaboliteTable(), moveObject(), CModelExpansion::replaceInMetab(), CQExpandModelData::slotCompartmentActivated(), and CQCompartment::slotMetaboliteTableCurrentChanged(). Definition at line 160 of file CCompartment.cpp. Definition at line 209 of file CCompartment.cpp. 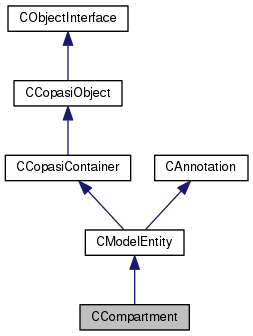 References CModelEntity::mpIValueReference, CModelEntity::mpValueReference, and CCopasiObject::setObjectName(). Definition at line 134 of file CCompartment.cpp. References C_FLOAT64, C_INT32, CReadConfig::getVariable(), CReadConfig::SEARCH, CModelEntity::setInitialValue(), and CCopasiObject::setObjectName(). Definition at line 195 of file CCompartment.cpp. Referenced by CModelAdd::addCompartments(), SBMLImporter::createCCompartmentFromCompartment(), CModelExpansion::duplicateCompartment(), and CQCompartment::save(). Definition at line 215 of file CCompartment.cpp. Definition at line 155 of file CCompartment.h. Referenced by getChildObjectUnits(), getDimensionality(), and setDimensionality(). Definition at line 45 of file CCompartment.h. Referenced by addMetabolite(), cleanup(), getMetabolites(), and operator<<().